Tuna Steak au Poivre is a successful variation on one of the tastiest and simplest dishes ever to come out of classical French cuisine. You can follow any of the numerous recipes available; just replace the traditional beef steak with tuna. Coarsely crush the peppercorns, preferably with a pestle and mortar. 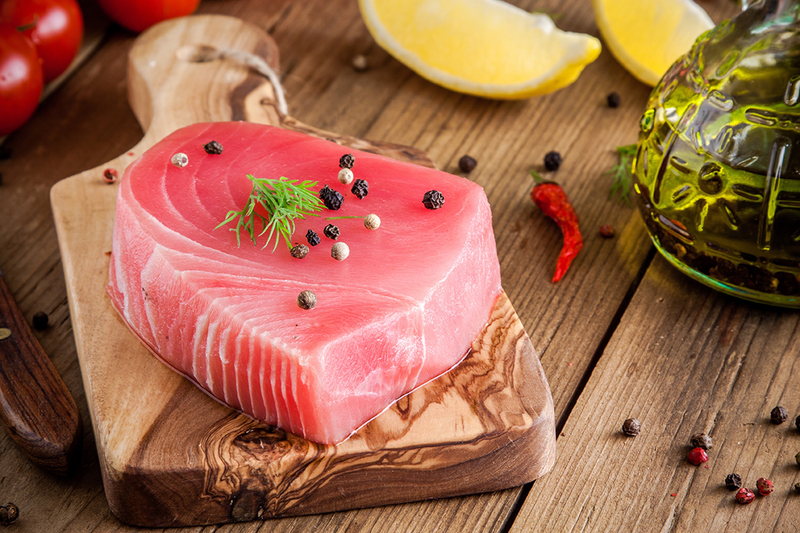 Rinse the tuna steaks in cold water, remove any excess moisture with a piece of kitchen towel, then coat both sides evenly with the crushed peppercorns. Heat the olive oil and butter in a heavy based frying pan over a fairly high heat. Just as the butter is starting to turn a light brown colour, reduce the heat and place the peppered steaks in the pan. Cook for about 2 minutes on each side. Carefully pour in the brandy and flambé. When the flames have subsided, remove the tuna steaks carefully from the pan and place them into a serving dish. Keep them somewhere warm. Add the double cream to the pan and stir quickly until it is gently bubbling. Pour the sauce over the tuna steaks and serve immediately. Delicious! Create this twist on a classic with a fantastic range cooker from Leisure. With a range of differing fuel types we have one right for you. Choose from a selection of electric range cookers, gas range cookers and dual fuel range cookers.